STAINLESS STEEL ACCESSORIES INCLUDED: Popcorn machine comes with a ½ cup measuring cup, tablespoon, popcorn scoop and salt shaker. TOP QUALITY: Fashioned with authentic antique style updated with modern features, this attractive popcorn machine offers visual appeal and lasting durability. Constructed of heavy-duty stainless steel, a whisper-quiet motor, 850 watts of power, and premium paint with a glossy finish, this machines industry-leading 8-oz. Kettle serves up to 3 gallons of popcorn per batch. CONVENIENT 3-SWITCH DESIGN: Easy operation with a simple 3-switch design makes popping fast and simple. Switches include a spot light warmer, stirrer, and pot heater. TEMPERED SAFETY GLASS: High-quality, tempered glass walls provide both protection and sturdiness, with superior resistance against scratching and warping. WARMING DECK & KERNAL TRAY: Built-in warming deck and heat light is just like a professional-grade popcorn machine, keeping popcorn warm and fresh. Machine also features a reject kernel tray for any loose un-popped kernels, ensuring every batch is served up perfectly. 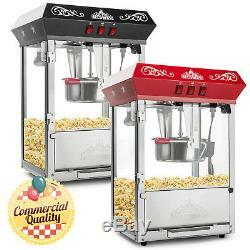 Enjoy making gourmet, movie-theatre style popcorn anywhere with the Olde Midway tabletop antique style popcorn machine. Offering nostalgic charm with a retro-style design, this premium-quality popcorn machine is equipped with completely modernized features for convenient, easy operation and lasting functionality. Ideal for adding novelty at school and church fundraisers and carnivals, businesses, parties, little league and varsity games, home movie theatres, and much more, this 8-ounce kettle can produce about 3-gallons of popcorn per batch to satisfy large crowds. Also makes a great gift for movie buffs. Constructed of highly durable materials including heavy-duty powder coated steel and stainless steel food zones, tempered safety glass walls, vibrant, richly pigmented premium paint, and a powerful, commercial-quality motor, this deluxe popcorn machine is built to last. Convenient 3-switch operation includes a spot light warmer, stirrer, and pot heater. Machine includes a warming deck and heat light to keep popcorn fresh and delicious, as well as a drawer to catch any un-popped kernels for a perfect batch every time. Cleans easily with water, and runs on a standard 110 volt for quick and easy setup almost anywhere. Includes a ½ cup measuring cup, tablespoon, popcorn scoop and salt shaker. Olde Midway is well-known within the industry for finely crafted, specialty appliances that combine stylish design with exceptional durability at a great value. The item "Vintage Style Popcorn Machine Maker Popper with 8-Ounce Kettle" is in sale since Friday, March 16, 2018. This item is in the category "Home & Garden\Kitchen, Dining & Bar\Small Kitchen Appliances\Popcorn Poppers". The seller is "mixwholesale" and is located in Fort Lauderdale, FL. This item can be shipped to United States.